At the beginning of my website, I was intent on teaching creative brides how to design their own wedding florals and save $$$ in the process. I created a small online store that carried the necessary floral products that professional use when doing flower work. I was only going to sell the hard goods and refer my customers to popular online flower farms. As I began scanning these websites, however, it frustrated me that they required such large quantitites before making a purchase. C'mon? How many brides actually NEED ten bunches of filler flower? Before buying flowers online, every bride should make use of a Wedding Flower Calculator to keep careful track of exactly how many flowers she needs to order to stay within her budgeted amount. Carnations are making a comeback as a popular wedding flower. They are economical and come in many different shades. They hold up well in everything from bridal bouquets to corsage work. 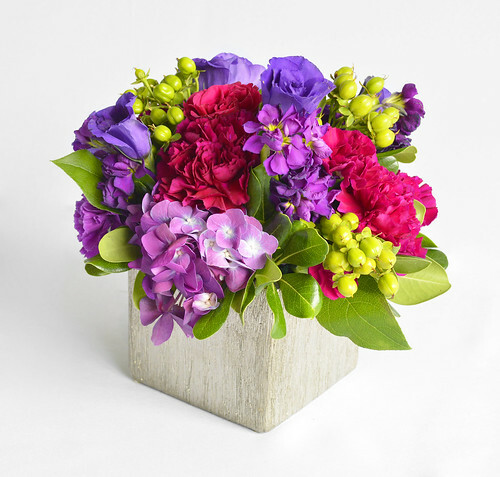 A beautiful mix of purple stock, hypericum berries, pink hydranges, and purple lisanthus mixes with standard dark pink carnations for a lovely bright centerpiece.